The long, exhausting days of harvest have almost come to a close and cooler days are signaling the start of fall here in Temecula Valley Wine Country. Our wineries are getting into the swing of the holiday season hosting a myriad of events such as “Haunted Wine Tours”, “Scary Movies in the Vines” and fall cooking classes. 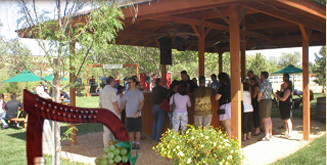 Check out our winery events calendar and plan to visit us soon! Thursday-Sunday / 11:00a-2:30p / Tours and vertical tasting of library Boudreaux reds. Call for reservations: 951-972-9768. Friday, October 3 / 5:30p-9:00 / Experience amazing sunsets and live music by Buzz Campbell while enjoying fabulous food and wine. Food items available for purchase. Call 951-308-1098 to make reservations. Seating is limited. Every Friday at Meritage from 5pm-8:00pm Enjoy a three-course Prime Rib dinner for $35 per person! Enjoy live music. Reservations are not required. Every Sunday at Meritage at Callaway from 4pm-8pm. Enjoy sipping on our very own Watermelon Sangria while soaking in the sunset vineyard views. Live music from local musicians begins at 6pm. No reservations required. Friday, October 31 / $12 per Wine Club member / $15 General Public / $8 Inter-winery / Two food trucks – Devilicious & Underdogs from 5:00p-9:00p / Live Music – OFFICIAL BIZ – 9:45p / Costume contest / Must be 21 years of age. Every Wednesday in October / 10:00a-5:00p / Doffo Winery will be offering a “winemakers selection” red wine from our tasting room for $25 per bottle. Buy a bottle and enjoy on our tasting room patio or buy a case at this discounted price! Bring out your creative side while enjoying boutique wines! The class is taught by one of Temecula Valley’s top art instructors. No art experience is necessary to participate and you will leave with a lovely wine country themed painting created by you! Includes a glass of wine and hors d’oeuvres. Every Sunday in October from 12:00p-3:00p. Sangria, BBQ & dancing. No reservations necessary. Saturday, October 11 / 11:00a-5:00p / $70 per person (tickets must be ordered by October 8th). Call 951-699-8845 for tickets. A festival day filled with eight competing restaurants in a Paella Cookout paired with Don Frangipani’s hand-selected wine varietals. Dance to the sounds of Latin music among the Tuscan views of the Estate throughout the day. Ten local vendors will provide hand-crafted clothing, jewelry, baked goods, gourmet sausage, art and more…..
Friday, October 24 / 5:00p-8:00p / Carve your own pumpkin for a chance to win some GREAT prizes! We provide the pumpkins & the tools! Costumes encouraged! Monday, October 27 / Featuring: Your Vote!! (What is your favorite scary movie? Vote on Lorimar Winery’s Facebook page by the end of September) / $1 Admission – Includes small bag of popcorn! Wine Bar and Concession stand will open at 6 pm. Film begins at Sunset on the Barrel Room Lawn! Bring your own beach chair or blanket! Wine specials, karaoke, live music and more! $10 cover at the door (gets you a glass of Spooky Sangria). Food will be available for purchase. Dress to Thrill! Complete for best costume & wine great prizes!! See you there…..if you dare! Marvelous Mondays – Mondays just got better at South Coast Winery’s Vineyard Rose Restaurant between the hours of 5:30pm to 9pm each week. Enjoy half-priced bottles of select featured wines with the purchase of 2 entrees. Call 951.587.9463 today or visit here. Available October 25-31 /4:00p / $50 per person / Space is limited to 24 guests per tour. Reservations are required by calling 951-587-9463. / Enjoy a behind the scenes Wine Tour with a spooky twist. Get up close and personal with the “ghouls and goblins” of harvests past. Our winemakers have gone mad, and this walking tour starts out in the vineyards, then proceeds into the haunted halls of the winery; however, one never knows who or what will appear before you to serve up the wines and just how it will be delivered. The tour concludes in the winery’s cellar for more haunted happenings and a chilling wine-FLIGHT and light-BITE pairing. As we head toward cooler temperatures and heartier fare, we’re partial to bold reds to warm us up and stand up to big flavors. Tempranillo is a great choice if you’re in the mood for a more intense red wine with hints of berries and plums. Tempranillo is a thick-skinned, black grape also known as the “noble grape” in its native Spain. The grape was brought to America, possibly as seeds, with the Spanish Conquistadors in the 17th century. Tempranillo came to California bearing the name Valdepenas. The Tempranillo grape is the main ingredient in Spanish Rioja and is often used in other blends due to its low acidity. Beef, lamb and sheep’s milk cheese such as manchego are all ideal to pair with Tempranillo. Of course, traditonal Spanish tapas are always a great choice to serve this wine. Many of our wineries produce this beautiful, powerful red which is the perfect wine for rich, holiday dishes. If you’re a fan of Cabernet Sauvignon but have never tried Tempranillo, here are a few to get you started: Masia de Yabar, Danza del Sol, Europa Village, and Frangipani Winery.